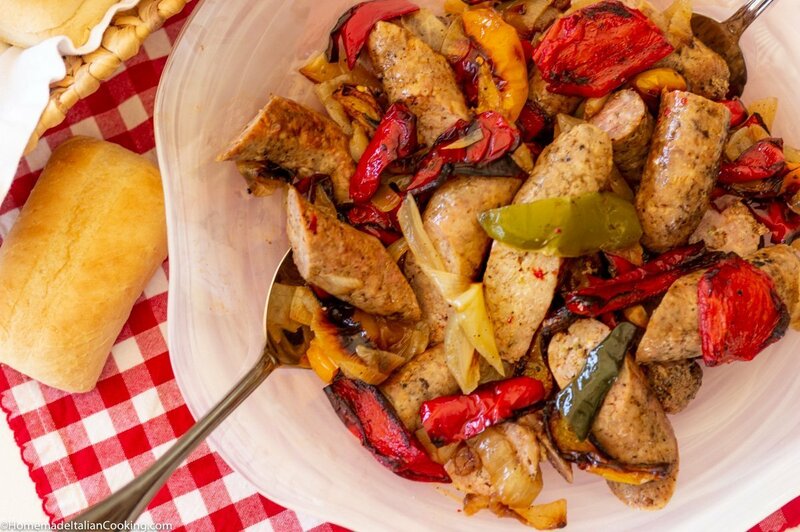 Sausage, Peppers & Onions is a classic Italian favorite, especially if you grew up in Chicago. My favorite way to make it is to grill the sausage on the BBQ to get that great char flavor, and to roast the peppers and onions in a hot oven. Combine the grilled sausage with the roasted peppers, onions, and all the juices. Maybe add a drizzle of olive oil. Serve Sausage Peppers & Onions hot or room temperature with crusty Turano sausage rolls (a well-known Chicago bakery). Add some scrambled eggs for a great breakfast sandwich. If I don’t have homemade Italian Sausage in the freezer, I like the sausage made by our local grocer, Mariano’s. Use a combination of sweet and hot Italian sausage. Buy it in coils if possible. It is easier to grill and cut. 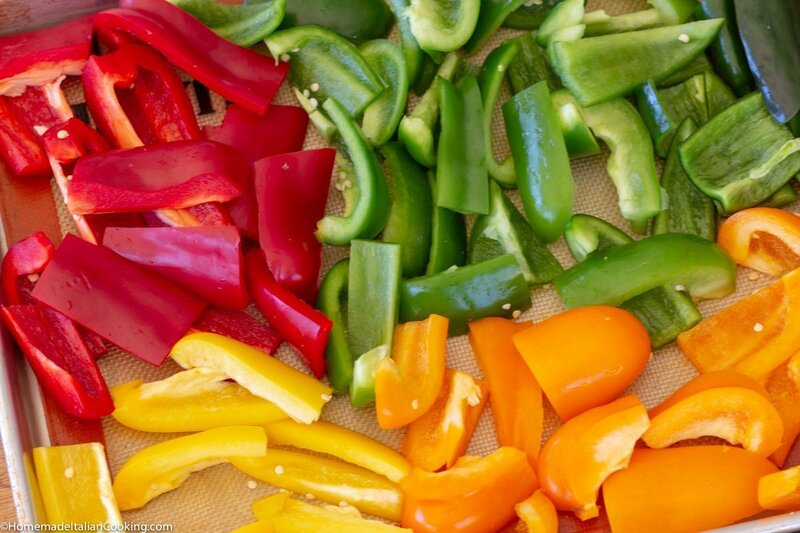 Use a combination of different color peppers for the best flavor and presentation. A few Anaheim peppers were added to this batch. If you can find Melrose Peppers when they are in season, always add those too! I prefer to roast the onions on a separate baking sheet from the peppers. They give off more moisture and sometimes need to cook longer depending on the type of onions, the size of the cut and amount. Drizzle the veggies with olive oil and a dusting of salt and pepper. Roast both the peppers and onions in a very hot oven for about 30 -40 minutes while you are grilling the sausage on the BBQ. 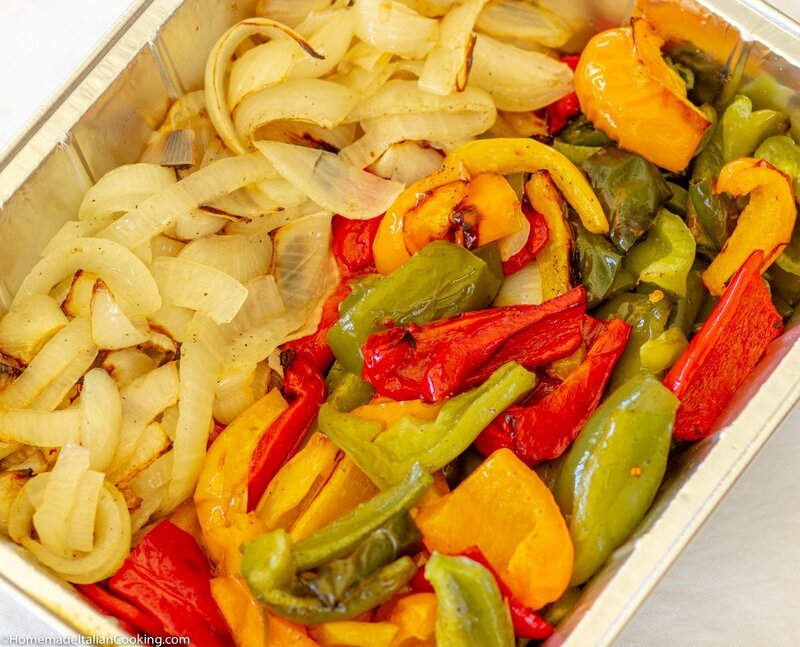 You can also roast the peppers and onions ahead of time and keep warm in a foil pan on the grill. If needed, drizzle with more olive oil to keep moist. Cut the grilled sausage on the diagonal and combine with the peppers & onions. Serve Italian Sausage & Peppers hot or room temperature with a good Italian bread. Remove the stems and seeds from all the peppers. Cut in 2-inch chunks, Arrange on a lined baking sheet. Peel and slice the onions. Arrange on a separate lined baking pan. Drizzle the peppers and onions with the olive oil. Toss to coat. Dust each baking sheet with salt and pepper. 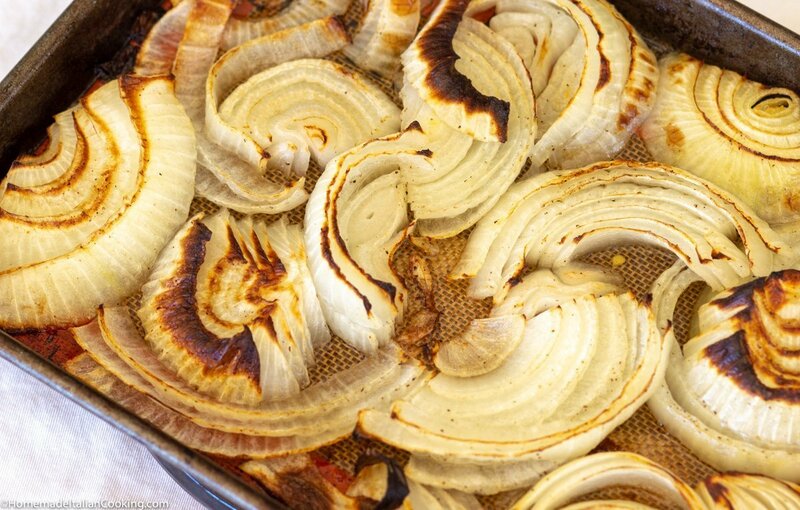 Place in hot oven and roast for 30 to 40 minutes or until the ends are charred and the vegetables are soft. The onions may take another 5 - 10 minutes to cook and slightly caramelize. Remove from the oven. Transfer peppers and onions with all the juices to a covered foil pan. Keep warm until the sausage is ready. 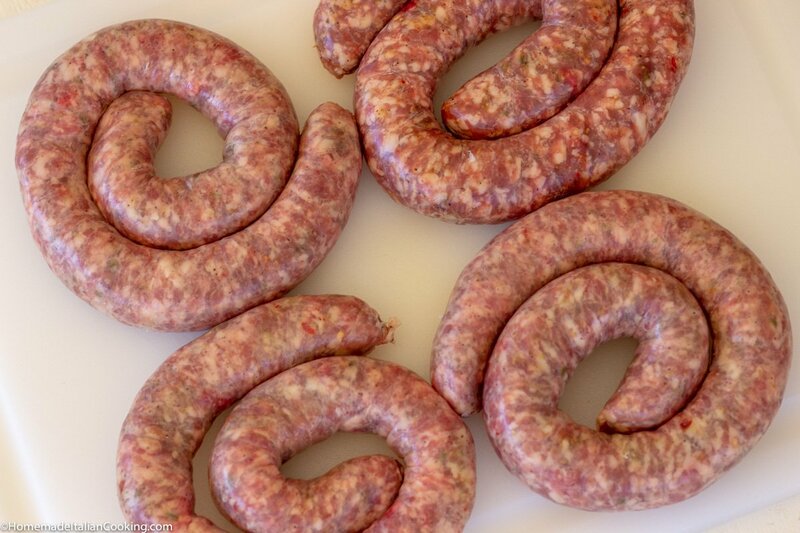 Cook the Italian sausage coils (or links) on a hot grill over direct flames for about 15 - 20 minutes. Turn occasionally to get even cooking and allow for grill marks. The sausage should be cooked until the pink has just left the center of the sausage. Do not overcook. Transfer the cooked sausage to a cutting board. Cut the sausage into 4-inch pieces on the diagonal. Combine the sausage pieces with the roasted vegetables and toss to combine the juices. Drizzle with more olive oil if needed. Serve in a large serving platter with cut Turano sausage rolls on the side. It is extra special to lightly toast the inside of the buns on the grill!